To make sure you get the best deal we'll show you great prices from all of our drivers, including Sheridan's Man & Van Service, if they're available on the day of your move. Have a question for Sheridan's Man & Van Service? No problem, send them a message and they'll email you back as soon as possible. If you have a more general question you might find it answered in the FAQ, or you always contact one of our brilliant customer service team. * Sheridan's Man & Van Service won't be able to see your email address. Based in Birmingham we are a local service you can trust. I underestimated widely and they didn't let me down. Hope they are having a well earned drink this evening. Adam and helper were just great; friendly and very careful with my belongings. They were a bit late (15mins) but called ahead to let me know and were very apologetic. Good communication and updating regarding the booked job. Positive company to be trusted. Great job by Darren and colleague ☺️. First class in every respect. Highly recommended. Very very good move!! Absolutely life saver! Highly remcommanded !!! I give AAAAAA++++++!!! Our driver arrived on time and was extremely respectful and helpful! He was very professional and couldn’t do enough for us. Highly recommend! Darren was very helpful and friendly. Careful with my items. Would use again. Punctual, friendly and highly efficient service. Ticked all the boxes and was available on very late notice. Fantastic service. Very prompt, polite and respectful of my belongings. Excellent service. Two items were inadvertently left on the van and their discovery only emerged a few hours later. They were returned to us before 9am the following day. (A Sunday!!). This was impressive. Top man arrived early, helped load and unload and wasn't shy to lift the heavier things. All done in fast timing to make the move easy. Would 100% reccomend. Great guy, worked really hard lifting everything for us. Really nice and helpful guys. Would definitely recommend! My driver was about 5 minutes late, so not enough to be a big bother. He was very friendly and helpful. Treated my items with care when moving them and we were able to complete the move within the 2 hour time slot I reserved. I would use him again. Thank you. The driver experienced some delays earlier in the day which resulted in him running behind schedule but kept us informed. He was a pleasant and respectful person. Darren and kai were great and moved everything where we wanted quickly and efficiently. Driver was very helpful and nothing was too much trouble. The move was made very easily and in good time. Darren and Glen are lifesavers....... Thank you so much for your help with our move yesterday. Would definately use your excellent services again. Helena and John. Would definitely recommend! Really friendly and helpful and got the stuff moved much quicker than expected! Great pair of guys, very professional, friendly with a great work ethic. Highly recommend them and will be using them in the future. Top job fellas ! Very happy with the service supplied. Would definitely recommend ???? Darren was really friendly and helpful throughout the day. Very-well organised and patient too; he took great care with all of our items and made the move much more manageable. Darren was nice, accommodating, he was helpful and professional. Definitely recommend! Very nice guy. Did what was expected. Just great service! Both from Man with a van and this website. All perfect! Driver was late but gave me loads of notice of his delay Had problems with tailgate when he arrived but was positive encorging and confident that he could fix it which he did cheerfully He was helpful and encouraging through all the small frustrations excellent communication skills and well deserved to be man of the month. Fantastic service and friendly conversation and banter! Will definitely use again - highly recommended. Darren was great. I arrived late to help with the packing but he used his initiative and started without me. Very nice guy and helpful and I would definitely use him again. Fabulous service, helpful and polite. Would highly recommend. We have been very impressed with the service provided by Darren: he couldn't have been nicer or more efficient. Very helpful, very practical and lovely driver! On time, chatty and a good worker, couldn't ask for more. Arrived on time and was very polite. Overall a great customer service. Amazing and very helpful. Moved efficiently and even gave me a lift to a hospital for an emergency visit with no extra charge. 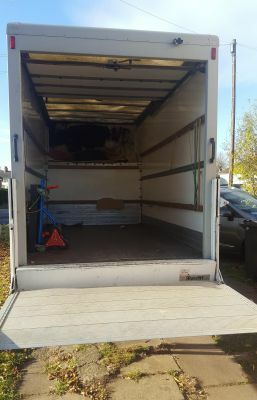 Very helpful, helped me move my things and lift my things to the van and helped organise the contents to prevent damage in transit and a great travelling experience with great discussions and jokes. Fully recommend! Very friendly and helpful driver, excellent punctuality and all round exceptional service. Helpful and friendly driver. Even though I didn't select for help he helped with the items I was moving anyway. I made the booking on Thursday afternoon for Friday 09.00 and received confirmation by email. I was phoned same evening by the driver to confirm a later time in the day due to double booking, and was called 30min before estimate arrival to let me know. I think the driver was very helpful and quick to deliver. Darren was polite, respectful, prompt and worked efficiently and hard from the moment he turned up. Would recommend and use again. Fantastic guy, would recommend to anyone! Very nice bloke, would recommend him to anyone. Very helpful and quick. Would recommend highly. Great driver, very respectful, handled all my items with care. Would book again! Very satisfied with the service & the help of the driver, would definitely book again, many thanks! Very good service, would absolutely recommend. My housemate messed up the booking but the driver was absolutely brilliant in accommodating our changes. I cannot recommend this man enough. He was punctual, professional and extremely careful with my belongings - would 100% use him again! Excellent service. Fab service, polite and respectful. Would recommend!